A new week and a new mood board to show you the colours by Graham & Brown I will use at my trend stand, it is such a fun way to show things don't you think. This whole project is so exciting and to be honest I have never done something this big! It is such an honour to have been asked by IMM, one of the most important European interior and design fairs, to show my very own style on 80 square meter. I hope to meet you and welcome you in my stand and show you around in my world. Find me at the Passage between hall 2-3 Stand P003. I love to build good relationships with brands and designers, and was really happy to find some I met during my travels exhibiting at IMM, and borrow furniture and accessories from them and other brands for the stand, I will also bring a huge suitcase filled with some personal things and the work of some designers I like and met during my travels for the blog. At the start of the project I found an amazing concrete wallpaper with a cool graphic motive but as said before I wanted to go beyond the black, the white and the concrete walls. Maybe I even wanted to challenge myself to use some colour, and go for a stylish and darker atmosphere. Some time ago I received the hand painted samples from the vtwonen wall paint collection for Graham & Brown, I immediately loved the matte and powdery appearance and asked them to work with me on this project. Luckily they loved to sponsor me, and with a sample of the dark floor I got sponsored by Solidfloor as a starting point, I choose for the colours 'Pine' and 'Flax'. When the layout of my stand changed during the process, I had to let go a few of my original ideas and therefore will use less green and added an additional light grey, all mixed with lots of cool furniture and a few bold and stylish black and hand made pieces. The innovative British wallpaper manufacturer Graham & Brown offers the latest wallpapers, wall decorations and paint for your house. Regularly they collaborate with well known designers in order to add new and creative work to the collection. Together with Dutch interiors magazine vtwonen they developed a paint collection consisting of 40 colours from basic to contemporary. The wall paint, which I also used in my stand, consists of a matte paint with a chalk look. 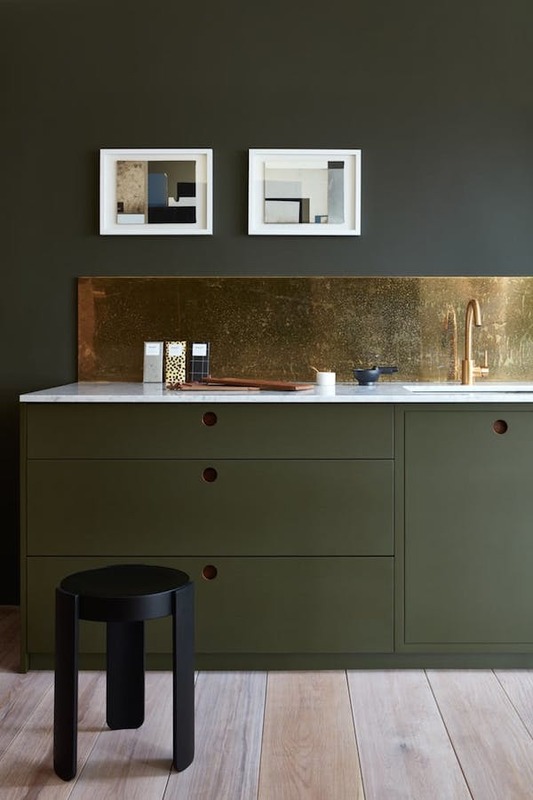 Colours can be combined with each other in order to perfectly fit every taste, and is next to wall paint available as a matte water based lacquer paint. The wall above was painted with paint from the collection. It is always fun to actually meet other bloggers and readers of Vosgesparis so I hope you will come and say hello and have a chat. We will have some cool prizes and exciting brands and designers to share on Instagram... let's connect! The Army green pouf is from the Cosima element sofa by Bolia which I will use in combination with some leather elements from the same collection, come and hang out on them! Stool and side tables by Stefan Knopp for Janua I really love these and can't wait to see them at my booth as they represent that raw element I love to bring into a home. 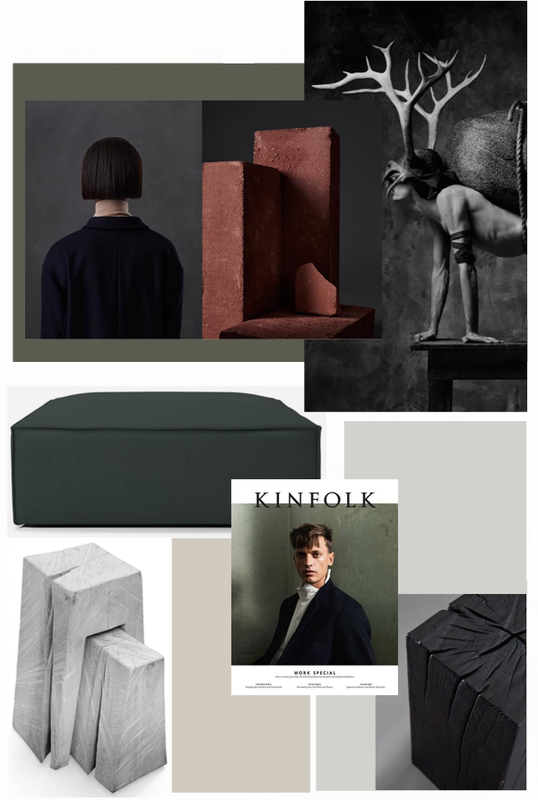 The other pictures in the moodboard are found at Kinfolk and tumblr.